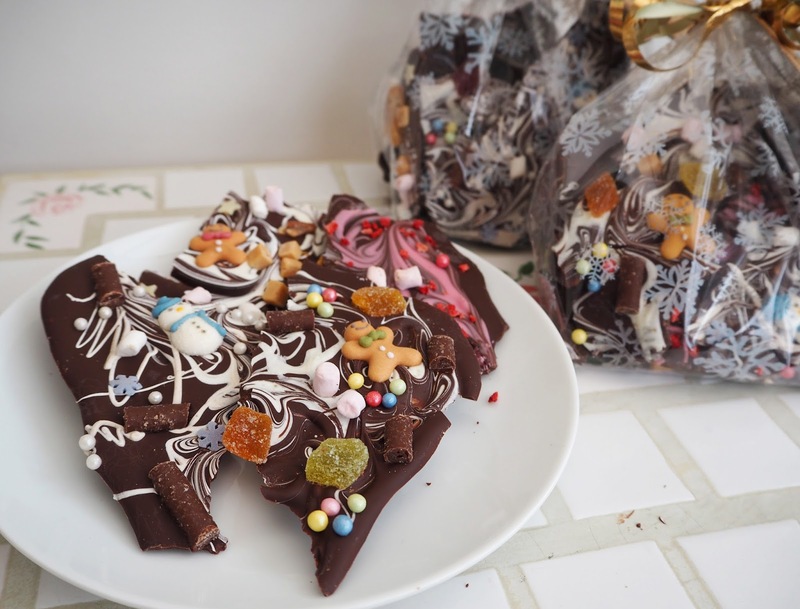 It's an annual Christmas tradition of mine to make my own chocolate bark to gift to my friends, family and neighbours over the the festive season. It's fairly quick and easy to make and is the perfect solution in a gifting emergency! There always ends up being a scenario where someone turns up with an unexpected present and you haven't got anything for them! 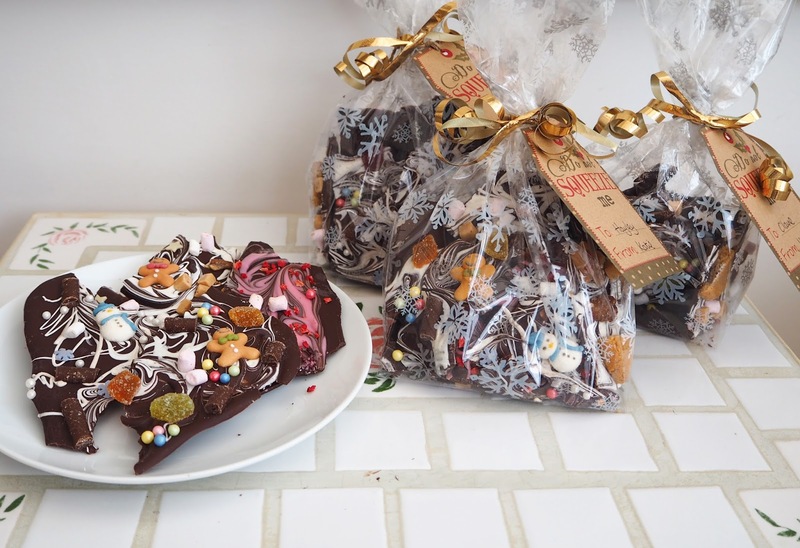 Some chocolate bark packaged in a simple cellophane bag and tied with ribbon looks really effective and thoughtful. I think most people welcome a homemade foodie gift! All you have to do is simply melt some of your favourite chocolate, I use a rich dark chocolate that's 60% cocoa. 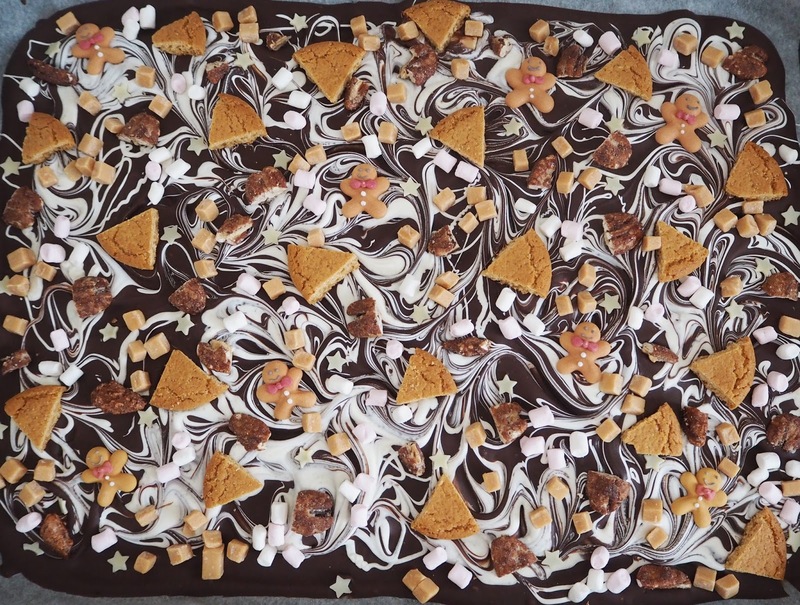 Once completely melted pour the chocolate onto a baking tray lined with baking parchment and spread with a pallet knife so it fairly thin. 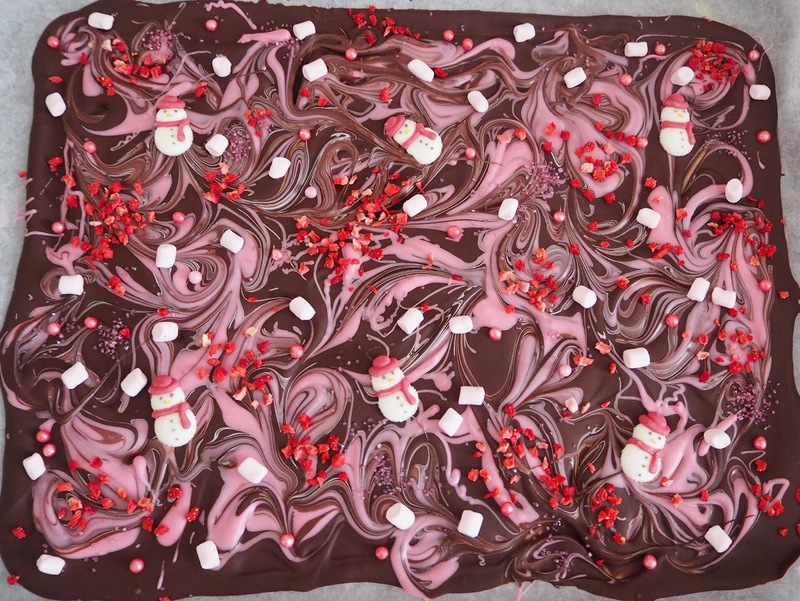 I then like to use some melted white chocolate chips or you can get pink strawberry chocolate buttons and swirl it through the melted dark chocolate on the baking tray using a skewer to create patterns. It creates a really beautiful effect and makes your bark look extra special! While the chocolate is still wet you can the sprinkle on your toppings! You can basically put anything you want or have on there. 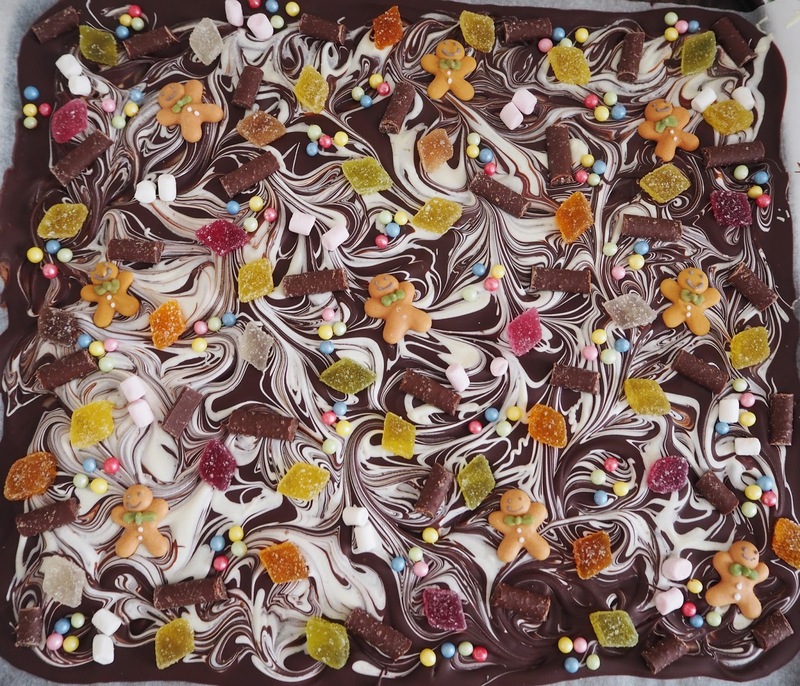 It's like abstract art but on chocolate! 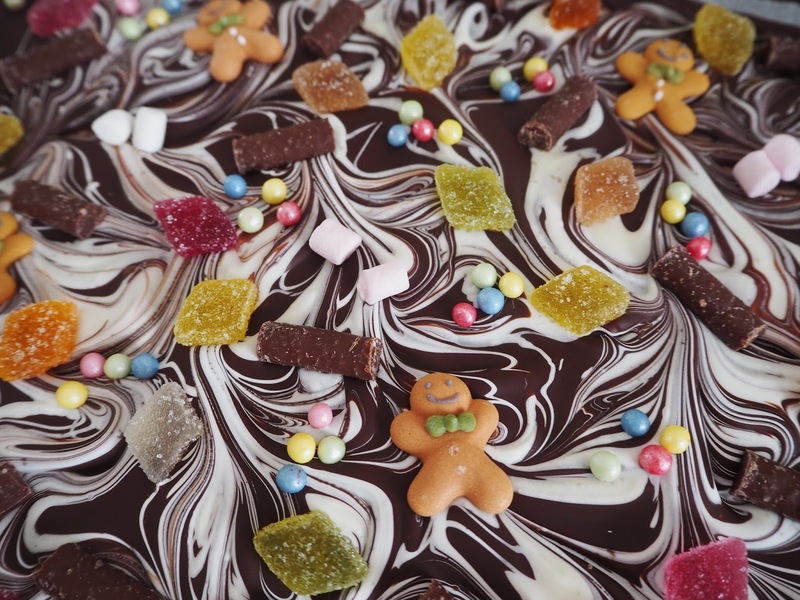 I like to use things like mini marshmallows, jelly sweets, fudge and honeycomb pieces as well as caramelised nuts, candied fruit and cookies. Then I add other colourful sugar sprinkles and festive sugar characters to keep things Christmassy! The sugar characters I picked up in sainsburys but you can find them in most supermarkets and hobby craft also have a good selection. Leave the chocolate to set on the tray. Then peal away the baking parchment, break into shards and package up as desired...or eat! It's up to you whether you want to temper the chocolate of not. You can temper chocolate using the method of heating (with guidance of a sugar thermometer), cooling and 'seeding' using unmelted cubes of chocolate. However when you're working with tempered chocolate I find it sets quite quickly. I like to have time to sprinkle everything I want over my bark and position the sugar characters in plenty of time before it sets. I don't feel it makes a massive difference to my bark by not tempering, it just lacks a bit of shine and a snap but it doesn't taste any different or last any longer in my experience. 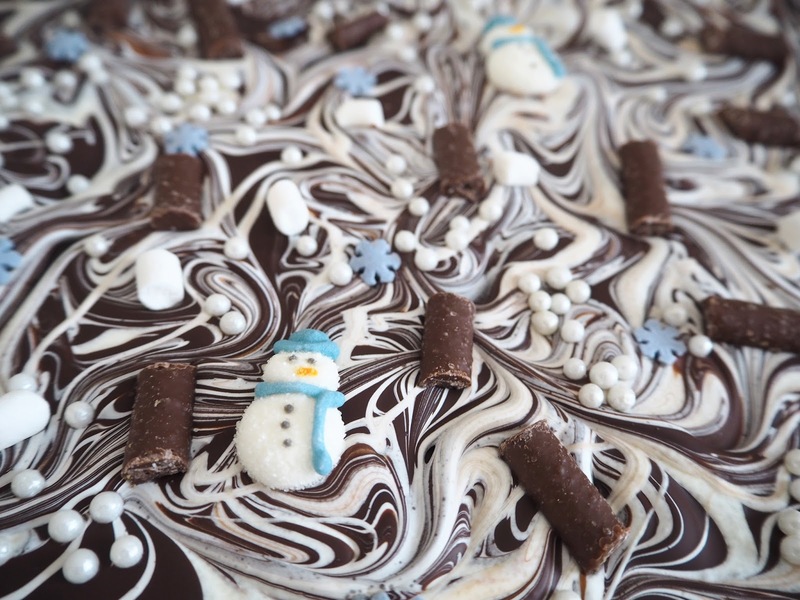 The swirled white chocolate and all the toppings mean you don't really notice the lack of shine anyway. Let's face it chocolate doesn't last very long in our house at least, before its eaten! 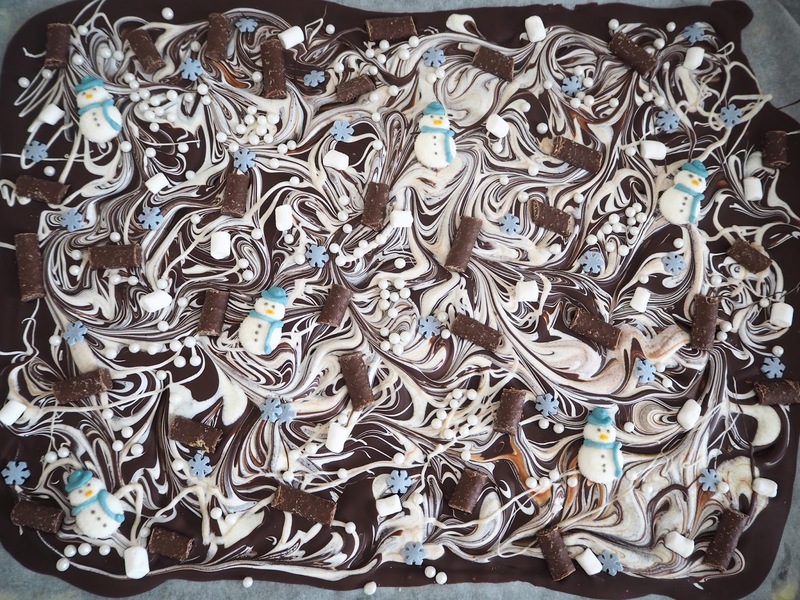 Mint Chocolate: White chocolate swirl, mint matchmakers, sugar snowmen, mini marshmallows, sugar snowflakes and sprinkles. 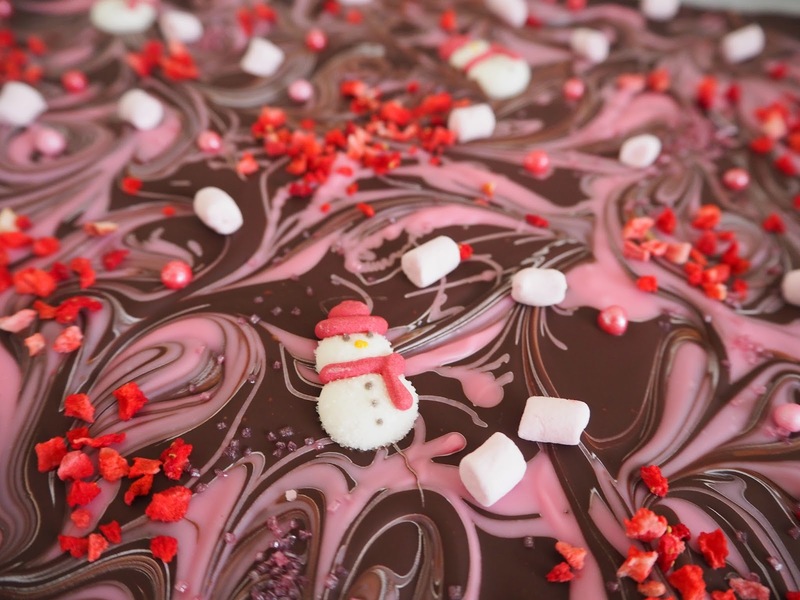 Strawberry: Pink coloured white chocolate swirl, freeze dried strawberry pieces, sugar snowmen, mini marshmallows and pink sugar balls. 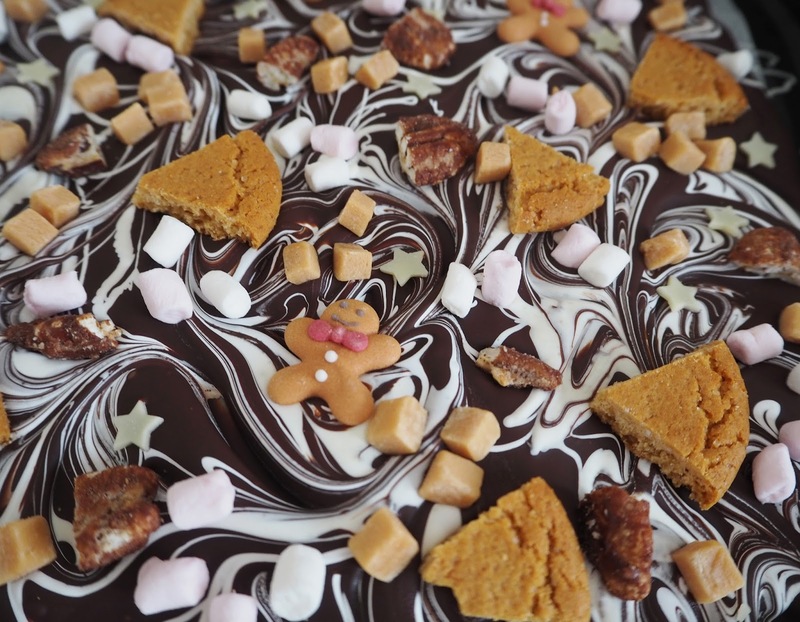 Rocky Road: White chocolate swirl, ginger biscuits, mini marshmallows, mini vanilla fudge pieces, caramelised pecans, sugar gingerbread men and white chocolate stars. 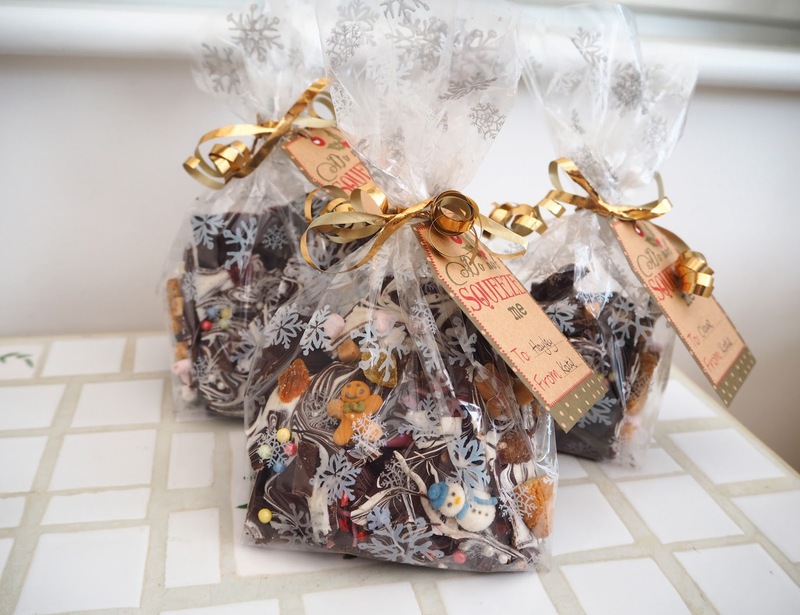 I use these snowflake printed cellophane bags from Lakeland and add gift tags with descriptions of what's on the bark. If you make this then please tag me on twitter and instagram I'm @katiekirkloves on both!